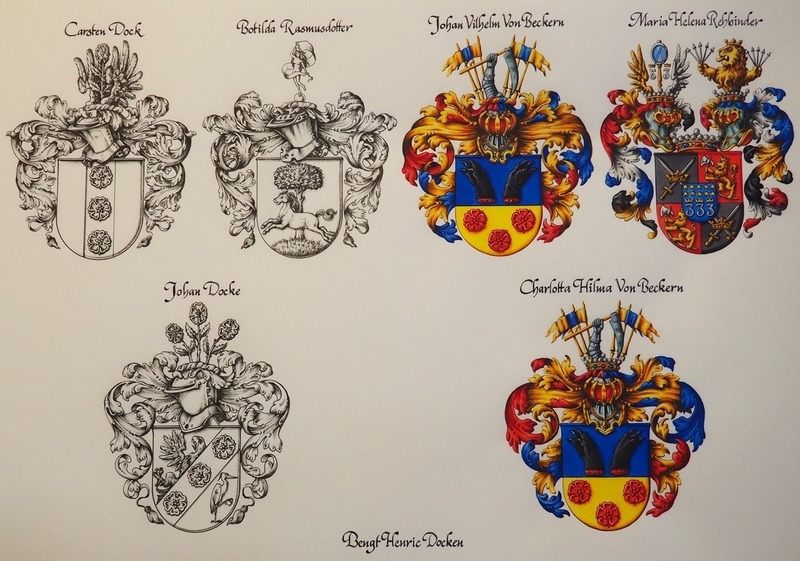 A few years ago, I was able to document my descent from several Swedish families who used coats of arms during the 17th and 18th centuries. I recently completed a study of my ancestors’ armorial seals and grants of arms, and I commissioned a painting by the heraldic artist Carlos Navarro. At the base of the painting is the name of a Swedish soldier, Bengt Henric Docken (1738-1782), who is my 5x great-grandfather in the direct male line. My branch apparently dropped the Dock name in favor of patronymic surnames sometime during the 19th century, and then it became fixed and anglicized as Nelson when my great-grandfather immigrated to the United States. Bengt’s paternal grandfather is Carsten Dock (1660-1718), a merchant from Hamburg and sometime quartermaster in the army of Charles XII who settled in the city of Malmö. Bengt’s father Johan Docke (1693-1767) was a cavalry officer who married a daughter of Major General (later Baron) Johan Vilhelm von Beckern and Baroness Maria Helena Rehbinder. The arms used by Carsten Dock and Johan Docke are only known from surviving seal impressions, so any colors or metals (if any) are unknown. The blazons can only be guessed at, but apparently the only similarities between the arms used by father and son are ordinaries charged with three flowers and flowers in the crests! Although there is no evidence of arms used by Carsten’s wife Botilda Rasmusdotter, I decided to cheat and include the arms used by Botilda’s brother Kjell Rasmusson to balance the composition of the painting. Kjell’s crest appears to be the goddess Fortuna holding a sail. The arms of Bengt’s maternal grandfather, Johan Vilhelm von Beckern, include two bear’s paws or gambs sable on a field azure. The quartered arms of Bengt’s maternal grandmother, Baroness Rehbinder, include an inescutcheon of pretence charged with the Arabic numerals 333, each numeral crowned, as well as ten mullets. These curious numerals were included in the grant made to Baroness Rehbinder’s grandfather Henrik Rehbinder. The numerals were apparently based on their ancient arms which were originally charged with three crowned and writhing snakes! The ten mullets were also included to honor Henrik Rehbinder’s ten sons in the service of Sweden. He is a super artist is Carlos. A lovely range of emblazonment's of your ancestors Sebastian. Thanks! Now I just need to figure out whether or not to alter my current arms. Goodness Seb, you have had the present arms for a long time now. It would be a big decision. Seb - how long ago did you assume your current arms? And have them certified by the Spanish Cronist? And then matriculated by Lyon? Etc. Why not just add them to an expanded version of your Swedish armorisl pedigree? Assumed circa 1995 (about 298 years after my Dock ancestor's arms first appear)...certified 2000...matriculated 2005. Why not quarter your modern and ancient Arms? Quartering old & new is one approach - in this case, maybe 1&4 Nelson (since that's your branch's legal surname in America), 2 Dock, 3 the other Dock? Or quarterly of enough to include thebmaternsl arms of your Docks. And for motto, below the shield maybe "What's Up, Docks?" And above the crest of a Coney sejant between two mallards surrounded by roses and poppies, "Sitting on the Docks of the Bay..."
But for everyday use, a bit complicated. You have the ancestral arms already displayed in a beautifully done pedigree; why not just stick to your own arms for signet or other day to day use? I've thought about quartering, but the lack of information about colors for the Dock arms stops me in my tracks. Maybe someday I'll find another Dock seal that uses Petra Sancta or some other hatching, or maybe a painting of their arms in an album amicorum. I hired a researcher to look for more Dock seals in some Stockholm archives, but without success. I've toyed with the idea of just choosing colors and registering the Dock arms with one of the Swedish societies, but it seems somehow inappropriate to do without consulting the Dock cousins in Sweden. However, if the Dock family in Sweden chose colors and registered the arms with one of the Swedish societies, I'd probably begin to use those arms somehow (maybe the ancient Dock arms with my Nelson arms in a canton). But which of the two ancient Dock arms? Plausible arguments could be made for (or against) either choice, with your own arms in a canton - easy with Dock St, but would obscure most of the demi-ragle of Dock Jr.
or for (or against) quartering the two Dock arms with your own arms as an inescutcheon. The main drawback to using your arms as a canton is size and complexity - a fairly complex design in a relatively small space, less than 1/4 (more like 1/9 +/-) the size of either of the Dock shields; and as noted, would still obscure an important element of Dock Jr.
As an inescutcheon, your arms could be as much as 1/4 of the whole without fatay obscuring either Dock design. Dock Sr is no problem, since it's corners are empty. Dock Jr would lose (obscured) different portions of it's two quarters, but the obscured corner portion of one quarter would still be there in the other. And for especially small renditions (e.g. a small signet) the inescutcheon could be used alone.